Hundreds of beautiful orchids will be judged for awards in 100 sq. ft. displays created by Sarasota, Venice, and Englewood orchid societies. A grand commercial display will highlight the entrance of the show. A variety of orchid hybrids and species will be available for purchase from expert orchid growers: Art Stone Orchids, Florida SunCoast Orchids, Krull-Smith Orchids, Louis Del Favero Orchids, Mac’s Orchids, Odom’s Orchids, Palmer Orchids, Phelp’s Farm Orchids, Plantio La Orquidea, and Smiley’s Orchids. Orchid growing supplies may be obtained from Hick’s Orchid Supplies, Hang-a-Pot, and Your Farm & Garden. Lovely works of art for sale will be shown by Stig Dalström Botanical Art, Carol Marcus-Epperly, Wearable Orchids by Robin Parsons, Lora Thomas Ceramics, Patty Blair, and Lois Carson. Classes to learn how to successfully grow these exciting plants will be scheduled throughout the two days. 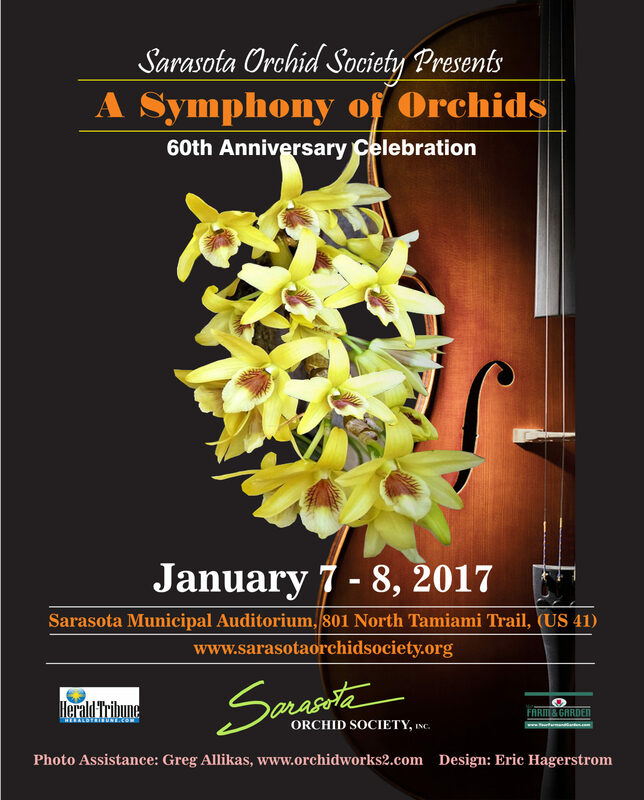 Join us for the Sarasota Orchid Society’s AOS-Accredited 60th Anniversary Show!